DETROIT — The choice of Kid Rock as the opening act for a new sports arena in mostly black Detroit has injected the musician into the national debate over race and culture because of his embrace of the Confederate flag, an expletive-laced criticism of NFL quarterback Colin Kaepernick and unabashed support for President Donald Trump. Olympia Entertainment selected Kid Rock to open the new Little Caesars Arena with concerts next week. 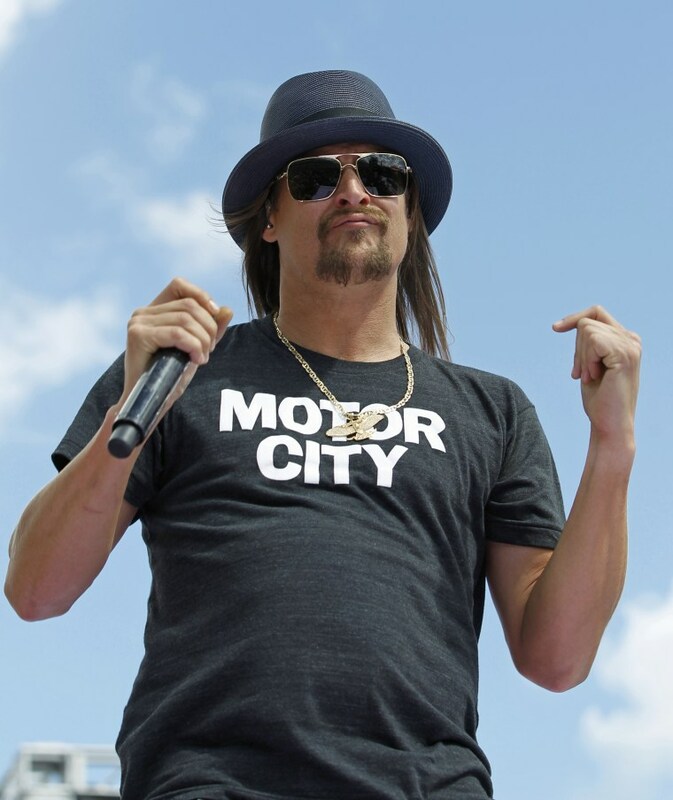 Kid Rock, who is white, has been lauded for his philanthropy and support of Detroit, but his recent criticism of Kaepernick has prompted one civil rights organization in Detroit to plan a protest and call for the concerts to be canceled. Kaepernick, who is black, refused to stand during the national anthem while with the San Francisco 49ers last year in protest of police violence and social injustice. During a concert last month in Iowa, Kid Rock told fans that “football’s about ready to start,” then went on to say, “You know what? (expletive) Colin Kaepernick,” the Des Moines Register reported. “Everything is different post-Charlottesville,” Hammer said, referring to a white nationalist rally in Charlottesville, Virginia, on Aug. 12 that resulted in the death of one counter-protester and injuries to many more. Kid Rock’s publicist, Kirt Webster, did not immediately provide a comment Wednesday. The arena will be the new home for the NHL’s Red Wings and the NBA’s Pistons. It’s owned by Detroit’s Downtown Development Authority and is managed by Olympia Entertainment, which is owned by Ilitch Holdings. The request to cancel Kid Rock’s concerts came from the National Action Network’s Detroit chapter, which plans a protest next week. The group has previously criticized Kid Rock for has displaying the Confederate flag at concerts. In May 2011, the NAACP’s Detroit chapter gave Kid Rock an award for his work in the community. About 80 percent of Detroit’s estimated 680,000 residents are black. “I’ve never flown that flag with any hate in my heart. Not one ounce,” Ritchie said before announcing $50,000 in donations from his foundation to Detroit recreation centers and other groups. He endorsed Trump during the 2016 presidential campaign and has been encouraged by the head of a major Super PAC aligned with Senate GOP leadership to run for Senate against Democratic incumbent Debbie Stabenow of Michigan. Webster Public Relations, which represents Kid Rock, said last week that the musician will give fans exclusive insight on his political views and aspirations following his first song at Tuesday’s concert. The arena is expected to anchor a massive 50-block neighborhood of offices, apartments, restaurants and shops. Detroit residents are helping foot the bill through more than $34 million in taxpayer-funded bonds, and community leaders attended a ribbon-cutting ceremony Tuesday.